NYC Are You Ready For Week One? Hey Dolphins fans! The season starts in two days. I can’t even believe it! This is probably the best team of the Philbin era so I am hoping we have a great year. At the very least I know Dolfans NYC are going to have a lot of fun at Slattery’s Midtown Pub and Sunday will be no exception. On the football side, I am a bit nervous about going up against the Patriots week one, but last time we played them we beat them so I am hoping week 1 will be no different. We got the heat on our side and our defensive line should put a hurting on Tom Brady… but they are still the Patriots and until we prove otherwise they are still the favorites to win this game. But this week at Slattery’s is going to be a party no matter what! Make sure you get there early! The bar opens at 11am and it is sure to be packed! The bar has more TVs this year, updated menu and specials on food and drinks. 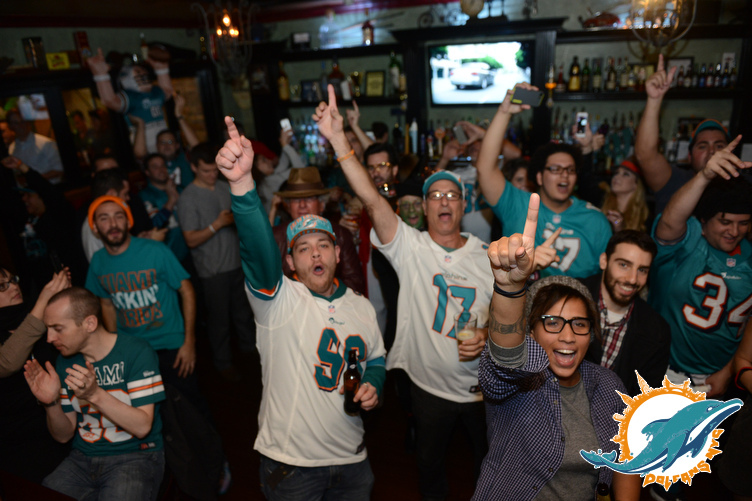 Plus we will be giving out discount cards f0r 10% off any time you come back to the bar not during a Dolphins game! We are going to have DJ Tropic DJing EVERY game this year. If you made it out to one of our prime time games last year you know how much fun it’s going to be with him DJing. And don’t worry, he only DJ’s during the commercials and half time. We will still have the sound on the game. Make sure to bring your wallets! We are having our biggest raffle ever this Sunday! The prizes are a surprise but there will be three prizes drawn every quarter and a 13th prize will be drawn at the end of the game and we can give that one away… it’s a signed Dan Marino ball! Plus everyone who wins will be given a Dolphins autographed commemorative ticket in addition to their prize! We have some pretty serious prizes picked out! We also have all new merch this year! We ended up buying a bunch of shirts from a t-shirt company that went out of business so we have some very nice shirts, including some blue ones. We also have black shirts for the first time ever and we have tote bags! Oooh! In addition we have more merch planned for later in the season when it gets cold so be on the look out for that every Sunday at Slattery’s. And remember, all the money we raise gets split between charitable causes and more great Dolfans NYC merch and events! We have raised more than $20,000 for charity in the last few years! I will be taking photos for the website this week and we have some other surprises in store for you guys both this week and for later in the season. It should be pretty epic this year and the Dolphins are working with us more than ever to insure that Dolfans NYC will be better and better. Can’t wait to see you guys on Sunday! Phins up! Posted in Events | Comments Off on NYC Are You Ready For Week One? Yesterday was amazing! We had so many people packed into our new home, Slattery’s Midtown Pub, that we took over both floors, not just the upstairs like planned. The only problem was the bar wasn’t quite prepared for the insane turnout so they were understaffed and it took forever to get food and drink. Fortunately, they know the deal now and will have plenty of staff on hand moving forward. The bar was amazed at the turnout and we are going to get all the kinks worked out and make this the best experience possible. All the problems aside, the day was so great and I know everyone had a fantastic time. So pumped moving forward. Michelle and I are both out of town for work next week but Alex will still have the shirts to sell, and I am sure someone will take over for me as far as screaming like an insane person all day. But we will be back for the Falcons Â game and we will plan something special for the Monday night Saints game! Anyway, I took a bunch of photos at our meet up yesterday so check them out. If you want to save a photo or something just click the slideshow below and it will open in a new window!